Noah Charney is a best-selling American author and professor of art history who has lived in Slovenia for many years. A regular in international media, whether for his books or his articles for major foreign press, including The Guardian and The Washington Post, he often writes on his adopted homeland, which he has called “the world’s best country.” He completed his PhD at University of Ljubljana on the subject of Slovenia’s genius loci, architect Jože Plečnik. 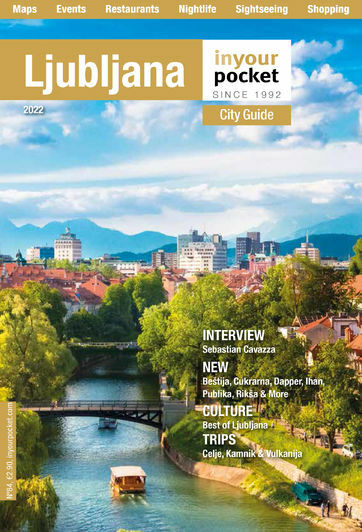 Since 2017 has been declared by Ljubljana Tourism as a Plečnik-focused year, it seemed like a good time to catch up with the good doctor and ask him a few questions. When did you first encounter Plečnik, and what about his work made such a big impression? When I first visited Slovenia, back in 2000 on a Eurailing trip, I was struck by his architecture. You can’t help but notice it, since most of the major (and most interesting) buildings in Ljubljana are his handiwork. He was a unique artist, someone who chose never to join a major movement (which is why people might not have heard of him, since he preferred to work in Slovenia, and was not a member of the biggest modernist movement, founded by Le Corbusier, CIAM, for instance). None of his pupils approached his excellence, and I think it’s safe to say that he is the greatest Slovenian artist in any medium. Ljubljana is very lucky that his career corresponded with a time of rebuilding—there was a bad earthquake in 1895 that ruined around 15% of the city centre. He got most of the biggest commissions for public buildings, and so there’s a real sense that Ljubljana is Plečnik’s town. He has stylistic and atmospheric parallels with Antoni Gaudi, but Plečnik designed far more buildings in Ljubljana than Gaudi in Barcelona. Plečnik used to say that the Slovenian national style was hard to define, but when he crossed the border from Austria, he felt a Slovene schtimmung, which is a great German word for which there’s no ideal translation, but it’s basically a “vibe” or atmosphere. Well, for me, Ljubljana has a Plečnik schtimmung. Plečnik’s house has recently been renovated and won an award for its new look. What are your thoughts? It’s beautifully done. Before, the house was charming but there wasn’t much of a museum to it, and you just took a guided tour. Now there is a lot of extra didactic material—visiting it is more of a “meal.” And you get a real sense of the person who lived there. Plečnik was very quirky. He looked and acted like a mystic, with his long white beard and tall black hat. He was an ascetic, keeping to strict diets and water therapies. I love quirky characters and his house helps to fill out a portrait of him. The City Museums did a great job. Do you have a favourite Plečnik building in Ljubljana? I think the atrium of NUK, the National and University Library, is spectacular. It’s covered in ink-dark stone, and as you ascend the stairs, you enter the beautiful, warm, bright reading room, which is a very human size. It’s a nice metaphor for books and learning illuminating us all. Why not, right? There’s so much Mona Lisa merchandise, so I think it’s great to promote Ljubljana and Plečnik in any way that works. I was actually thinking that it would be great if some artisan firm would produce Plečnik-designed chairs. They are amazing, and I bet a Kickstarter project would take off. Hipsters from Brooklyn to Copenhagen would totally go for hand-crafted Plečnik furniture. It’s true. My doctoral dissertation is being turned into a beautifully-illustrated book. It’s a scholarly biography of Plečnik and his work, specifically about why he made the decisions he did to forgo a higher-profile career in Vienna or Prague, and return to his homeland. It will be published by the City Museums of Ljubljana and Totaliteta, and be available in Slovene and English. Yes, I’ve been busy. In April, Beletrina will release an essay collection, in Slovene and English, called Slovenology: Living and Traveling in the World’s Best Country. And in September, a novel I wrote long ago called To Catch the Devil, which takes place in Slovenia (and which features Plečnik as a character) will be published in a small, boutique print run. It’ll be a Plečnik-fest! Noah will be contributing regularly to In Your Pocket, with new material in each issue this year, so stay tuned for more. And to learn more about his work, you can visit noahcharney.com or join him on Facebook.